White label your website for agents to use. Increase exposure and traffic to your project's website. Agent Tracker is the feature that instantly white label's a project's website. Agent Tracker is a patented technology that automatically white labels a project's website for agents to use in their marketing. Image to the right is an example of a project's website with Agent Tracker active showing how the website is white labelled for the referring agent. Why should you white label your project's website? Receive more traffic to your project's website. Agents control their buyers while you control the brand. Incentivise agents to promote your project to their buyers because Agent Tracker enables them to retain control of their clients. No more cease & desist letters. Help agents who are motivated in selling your project. Give agents the tools they need to effectively promote your project. Understand the ROI of your agent program. Reports will let you know which agents are promoting your project to their buyers. 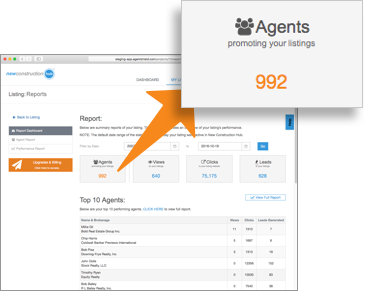 How does Agent Tracker work? Agent Tracker is an add-on to your project's website. Very simple to add. ROI of your agent program. Know which agents and how well they are promoting your project. Use the form below to schedule a no-obligation demo.